“A country girt by sea…” is most apt to describe Australia with 99% by weight of our international trade being carried by sea and 74% by value (source, BTRE 2001/02). Historically, the provision of scheduled shipping services started the innovation of steam propulsion enabled carriers to give their shippers guaranteed dates of delivery, which was impossible when only sailing vessels were employed. However, shipping operations were easily and severely disrupted by the unfettered competition which prevailed because of the advent of steam propulsion – the same technological advance that allowed schedules services to start in the first place – had greatly increased the effective supply of shipping space. The opening of the Suez Canal in 1869 also led to excess capacity. There were no beneficiaries of the savage, competitive excesses of the rate wars that followed; those shippers who initially gained from unprecedentedly low rates, later found themselves stranded when their regular carriers had been driven out of business. It became patently evident that a commercial solution was urgently needed to quell the inherent instability of the liner trades, in the interest of both the carriers and their customers. The breakthrough came to be known as the Conference system. Thus the Calcutta Conference was formed in 1875 and is often cited as being the first, although in fact the North Atlantic Conference was formed prior to this in 1868, and there is evidence of earlier Conference-type arrangements particularly in short sea routes. A major reason behind the formation of Conferences was the regulation of competition between carriers, through the setting of mutually agreed freight rates and conditions of service, so that the trade might benefit from the rationalisation that co-ordination allows, but competition prevents. There were also other important contributory motives. Thus the opening page of the Calcutta Conference Agreement explicitly states that purpose behind the Agreement is to operate “in the way most advantageous to the trade and those engaged in it”, with the object being to “maintain a regular and sufficient supply of steamship tonnage to meet the requirements of the trade”, and “generally to consider the reasonable wishes of Governments, Merchants and Shippers”. “In December 1876, a sub-committee of the London-based Melbourne Shipping Association submitted a scheme for the formation of an association consisting of eight firms interested in the shipping trade between London and Adelaide, Brisbane, Melbourne and Sydney” (source, John Bach’s “Maritime History of Australia ”, Pan Books 1976). 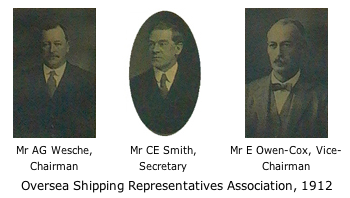 It is important to note that on 27 July 1912 the Oversea Shipping Representatives Association was formed in Sydney to represent all the Conference Lines trading to Australia. In the 1920’s many of the Lines were incurring serious losses and by 1929 it was evident that the Conference Lines would have to substantially increase freight rates and this led the Australian Prime Minster to convene an Overseas Shipping Conference which met in Sydney in April 1929; being a meeting between the Lines and exporters to discuss the case for a freight increase. The meeting recommended that an Australian Oversea Transport Association (A.O.T.A.) be created which would comprise both Federal and State Exporters Oversea Transport Committee (E.O.T.C.) and shipowners in the form of the Shipowners Oversea Transport Committee (S.O.T.C.) which would encourage the rationalisation of tonnage, consult on freight rates and agreements between individual shippers and shipowners involving essentially primary exports. (ibid John Bach, page 301). For the development of the commerce of Australia and for the carriage of produce, an efficient and speedy service of suitable vessels is necessary at stable rates. That if increases in rates for freight to and from Australia are to be avoided, or reductions in freight made possible it is necessary to secure great economies, and we must explore not only dues, charges and other expenses at the ports, but the major economy possible by the most efficient use of expensive vessels, ie. rationalisation. That inasmuch as Australia buys and sells overseas, and to reach a vast distant markets requires a regular service of fast, special vessels at stable and not excessive rates and the occasional incursion of outside vessels when trade is flourishing causes waste and increases the cost of maintaining the service during the seasonal or period depression, the Conference recommends that any legislative bar to the making of agreements for the carriage produce should be removed as being injurious to the welfare and economic development of Australia; but prompt action in this matter is essential as rationalisation of overseas transport is largely dependant upon such prompt action. The Conference accepts the principle that rates of freight should be determined in the country of origin of the cargoes. Promote conditions in the international liner cargo shipping industry that encourages stable access to export markets for exporters and in all States and Territories. It is interesting to note the comment in the minutes of the meeting of Council of A.O.T.A. in August, 1946 that a shipper representative stated “I personally am strongly in favour of the resuscitation of A.O.T.A. I believe, as I think we all do, that every Australian will concede to the British owner his right and title to build this trade back, and without which I believe the British Empire will not succeed. The lifeline of our Empire is our shipping, and to that extent we have to stand behind the British owner.” Times have changed! The second World War decimated the great fleets of stately, passenger-carrying cargo ships; most of them falling prey to U-boats and mines. This caused shipowners to embark on a huge shipbuilding program. Not only was this aimed at restoring their fleets to pre-war capacity but also with a view to cope with the burgeoning trade, particularly between a starving Europe and Australia. Trade to and from other destinations was also growing to unprecedented levels, as life and living standards were being restored after the restraints of the six dark years of war. Trade growth was a big challenge to Port Authorities throughout the world and ports in Australia were no exception. The port of Melbourne exemplifies the planning found necessary and actioned during the following 20 years in which the ‘conventional’ ships became larger, vastly more numerous and requiring deeper access channels. Melbourne boasted 69 cargo berths and despite this, by the early 1960s, could barely cope with demand. Indeed, during that decade, it was a common occurrence to have up to 20 ships at anchor awaiting a berth. It should be recognised here, that the same chaos prevailed in major ports throughout Australia. This stultifying congestion could not be attributed to lack of effort by any single participant in the supply chain. The very system itself, in which every item of cargo was subjected to at least five man-handlings before it left the wharf precinct on a road vehicle, was the key factor. By far the most dramatic change in the thrust of port development occurred in the mid-1960s when major ports were charged with the responsibility of preparing for the introduction in 1969 of purpose built, cellular container ships on the Europe to Australia Trade. The wide-sweeping change both to port infrastructure and work ethics proved over time, to have a greater effect on commerce and industry, than the change from sail to steam. There have been many enquiries into the Conference system. The Royal Commission on Shipping Rings, reporting in the U.K. in 1909, concluded that Conference arrangements are necessary if shippers are to be provided with regular and efficient services at stable rates. The Commission also regarded it as a necessity to permit closed Conferences, and were totally opposed to any Government regulation in such a complex multi-national industry. Shortly afterwards, in 1914, the Alexander Committee reported in the U.S.A. and like the Royal Commission, it too saw Conferences as a necessary means of regulating competition in order to avoid the wastefulness of the price wars that would otherwise occur. In addition, the Committee extolled the virtues of the regularity of service, the faster and better ships, that the Conference system provided. However, unlike the Royal Commission which advocated the development of shippers’ councils to prevent any possible Conference abuses, the Alexander Committee, being conditioned by prior legislation such as the Interstate Commerce Act and the Sherman Act, recommended Governmental regulation of Conferences. Its findings were enacted into law in the 1916 Shipping Act. It is also interesting to reflect on the freight rates in the early days for greasy wool (per farm bale) which was 3 farthings per pound in 1914. It is interesting that on a weight for weight basis the current freight rate would be about 5 Australian cents per pound which is testimony to the massive increase in efficiency and the cost reductions the era of containerisation brought about. There have been four major reviews of Part X of the Trade Practices Act in Australia. It is useful to examine the old conventional vessels such as a vessel like the “Roebiah” which was owned by the Holland America Line and was operated in the Australian trade in the late 1940’s and was a converted aircraft carrier. Being an open shelter deck, the gross registered tonnage was 8,202 tons (8,337 tonnes) with a draft of 29’5.18” (just under 9 metres) with bale space of just under 720,000 cubic feet or in today’s terms, 720 twenty foot containers. The service speed would been around 16 knots. Contrast this with the introduction of containerisation into Australia on a regular basis with the arrival of the “Encounter Bay” in March 1969 which had a capacity of 1,572 Twenty Foot Equivalent Units of containers (TEU’s) and a laden draft of 10.7 metres and she replaced approximately two conventional vessels on the UK-Australia service. Compare “Albatross” class vessels on the Eastabout service from Europe to Australia/New Zealand to America and back to Europe introduced two years ago with each vessel having a service speed of around 25 knots and a capacity of 4,100 TEU’s. They are 280 metres long with a beam of 32 metres and a draft of 12.5 metres when fully laden. Times have changed! Prior to 1955 there were partially converted container ships in service but they did not involve Australia. Interestingly in Australia, in 1964 the “Kooringa” was the first purpose-built fully cellular containership in the world. As mentioned above, the first regular container services internationally were introduced in Australia in early 1969. Enormous investment was required to change trades from the traditional conventional methods to the large investment required with containerisation which was beyond the scope of any individual carrier and by pooling individual Lines interests there was the possibility of operating on a scale much larger than what was possible with conventional shipping and this led to the formation of groups of Lines in consortia. An early one was Overseas Container Lines which comprised the Peninsula and Oriental Steamship Navigation (P&O), Furness Withy, Ocean Transport and British and Commonwealth and another UK consortium called Associated Container Transportation (ACT) comprising Blue Star, Ellermans, Port Line, Harrisons and Ben Line. Early in the 1970’s there was an increase in the formation of consortia comprising different nationalities and this has continued on to this day. Initially, the liner shipping Conferences and their constituent consortia carried high percentages of the world liner trade, and this was given a boost with the 1974 UN Code of Conduct for Liner Conferences. However, by the early 1980’s, revenue was being eroded as a result of increased competition, particularly led by developing countries as well as the rapidly increasing vessel size as carriers sought to maximise cargo carried within panamax dimensions. The relatively limited membership of consortia could not resist these pressures and like-minded Lines attempted to link their capacity more directly to existing trade and anticipated growth by entering into a stabilisation and discussion agreements comprising a broader membership base of what was previously Conference and non Conference Lines, such as the Trans Pacific Stabilisation Agreement, the European Asia Trades Agreement and the formation of a new Conference at that time, the Trans Atlantic Agreement. Discussion Agreements allow the setting of freight rates by non binding consensus rather than compulsion, and to provide for short periods of notice for a party to withdraw. Besides the new capacity being introduced under the berth, there was a slowing in the rate of scrapping of old shipping tonnage which added to the capacity and applied downward pressure on freight rates. Competition for these agreements has increased as a result of an increase in transshipment options which often applies a lot of competitive pressure to both Conferences and discussion agreements. The traditional Conference services with its binding shipper contracts, duel rates and rebate system, and unity amongst members became severely strained in the early 1980’s with the increase in competition and, in the Australian trades, there has been a subsequent growth in discussion agreements in many of our major trades. Whilst the old Conference agreement with shippers has long gone, service agreements between individual shippers and individual shipowners or groups of shipowners are much more common place although they cannot be considered loyalty agreements as in the past. Rates are set for a period under those agreements. Vessels have continued to grow in size with over 18,000 TEU ships now being built for the major East/West Trades in the world. The size of vessels calling into Australia is continuing to increase and within the next decade 4,500-5,000 TEU ships will call at Australian ports. Increasingly we will see the strengthening of all supply chain partnerships including shipping Lines and their customers as well as other vital links in the through transport chain. Increasingly a partnership approach will be adopted that will ensure that those links will see their partners as adding value to their own business and not simply as an add on cost. In reviewing our rich maritime history, perhaps this concept has been with us for a much longer period of time then one would initially imagine. It may not be a new concept.